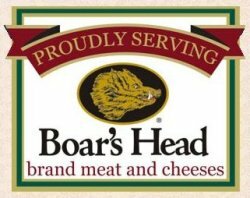 Our Deli takes pride in providing only the best Boar's Head Meats and Cheeses. With Boar’s Head, you’ll enjoy the rich, full flavors of European-style deli favorites. These finely crafted meats and cheeses are made with pure ingredients the old fashioned way – no fillers, by-products or artificial colors or flavors. And they’re all gluten free!